Ernesto Perez Carrillo the former genius behind La Gloria Cubana is back and has just released his regular core line of cigars. 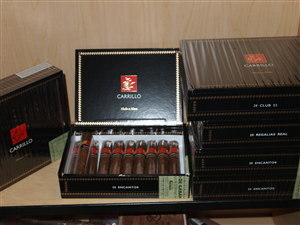 We first saw the introduction of this brand last November with the Edicion Inaugural 2009 Encore cigar. We waited with baited breath as EPC started talking about a regular line of cigars to hit the shelves in early spring, but to no avail. In the late spring, early summer of 2009 they gave us the EPC short run, a very limited selection which proved to be a runaway best seller. They are no longer available, and once again we find ourselves wishing for EPC's on the shelf. Well they have finally arrived after being released at this years IPCPR in New Orleans and they are fantastic. A fuller bodied version of the Short Run, this cigar will have you coming back for more. Like the Viaje cigars we can look forward to short run micro batches throughout the year from EPC.